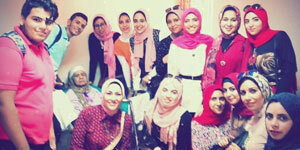 Under the Student Activities Administration, Sootak Student Club organized a visit to Mohamed Ragab Care Home for the elderly on Tuesday 16/10/2018. During the visit, a large number of the faculty students helped some of the elderly to have a physiotherapy treatment. The coordination of the visit was managed by Prof. Rania Hassan, the student activities leader.